When it comes to weight loss, the only way to be successful is to burn more calories than you consume, notes the Mayo Clinic. You can do this by reducing the number of calories in your meal plan and by boosting your daily physical activity. There are certain foods that have been shown to assist in weight loss for various reasons. Not only are mushrooms very low in fat and calories, but they can also trick you into thinking you're eating a meaty and rich meal. In fact, according to Brierley Wright, M.S., R.D. 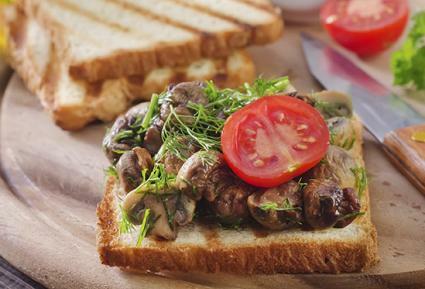 in Eating Well magazine, mushrooms can be just as satisfying as a meal that contains meat. That's because they're dense and filling, but without all the saturated fat and calories in some cuts of meat. Furthermore, a study published in The Journal of the Federation of American Societies for Experimental Biology reports that there was no difference among participants' hunger, satiety and palatability ratings when mushroom eaters were compared to beef eaters. What does this mean for you? You can substitute mushrooms in meals that traditionally contain meat for a meal that won't leave you hungry, but helps you cut calorie intake too. Check out the following ideas. Use a large Portobello mushroom cap in place of a ground beef hamburger patty. Add chopped mushrooms to chili or stew in place of ground beef. Pile a sandwich with sliced, cooked mushrooms in place of roast beef, dark meat poultry or fried fish. Try mushroom fajitas, tacos or burritos instead of loading yours with meat. Layer mushrooms in lasagna or mix them into spaghetti sauce in place of sausage. Legumes are a great substitute for meat in your diet, which can slash fat and calorie intake without leaving you hungry, according to the Mayo Clinic. Again, this is because legumes are high in fiber, which satiates your appetite for minimal calories. Try adding the following to salads, soups, Mexican dishes or as a healthy side dish. Foods that are high in fiber and low in fat play a key role in weight loss, according to research published in the journal, Nutrition. That makes apples an ideal choice with only about 95 calories each, but with a whopping four grams of fiber each. Of course, eating an apple as a snack is a great choice, but check out these other easy ideas that help make eating apples more exciting. Keep in mind that this benefit extends to many other fruits as well, notes the study, so you can incorporate others into your meal plan as well. 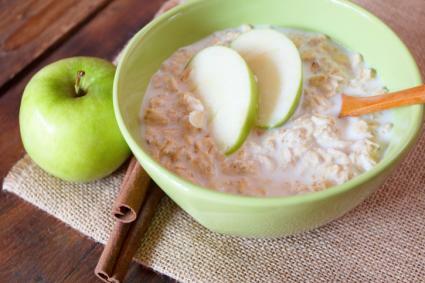 Add chopped apples to oatmeal with a dash of cinnamon. Pair sliced apples with goat cheese and arugula for a new and interesting lunch salad. Combine apples with low-fat cheddar cheese in a sandwich. Nibble on apple slices with a bit of reduced fat peanut butter while you watch television or after you finish a workout. While research findings indicate that eating yogurt is associated with effective weight control, the reasons why aren't so clear. A study published in the New England Journal of Medicine reports that more weight gain occurred with a decreased yogurt intake. This might be because people who eat an otherwise healthy diet include yogurt as a staple or it could be because the probiotics in the yogurt promote healthy digestion, add the experts interviewed for a Forbes magazine article. The reasons might not be evident, but the results point to yogurt as a great choice for weight loss. Watch out for flavored versions, which are often loaded with added sugar. Instead, opt for plain yogurt and try out these tasty ways to include it in your meal plan. Top plain yogurt with chopped, fresh fruit and a drizzle of honey for breakfast. Use yogurt as a substitute for sour cream on baked potatoes and Mexican entrees. Whisk plain yogurt with vinegar, garlic, spicy mustard, red onions, salt and pepper for a healthy and delicious salad dressing. Use yogurt as an ingredient in marinades for chicken breasts or salmon. No doubt you've heard about the grapefruit diet. While it's not a good idea to subsist on them alone, these delicious citrus fruits can help you drop weight. That's because they are an energy-dense food, which means they give you plenty of fuel and fill your belly, but with zero fat and very few calories, according to a study published in the journal, Nutrition and Metabolism. Eat a grapefruit before your main meal, which is called "preloading." You'll fill up on the grapefruit, which can help you eat less when your entree is ready. This is effective at breakfast, lunch and dinner, notes the study. According to research published in the International Journal of Obesity, adding eggs to a low-calorie diet can assist with weight loss. Even when the calorie counts of the egg breakfasts matched that of bagel breakfasts, participants who ate eggs for breakfast were able to lose more weight than their counterparts. The reason may be because eggs are full of protein, which satisfy hunger and keep you going throughout the day. Eggs are great in the morning, but you can include them at other meals to help you control calorie intake. Scramble eggs with sliced vegetables for a satisfying meal morning, noon and night. 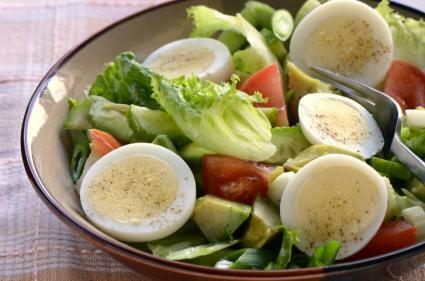 Add chopped hard-boiled eggs to a salad to give it more bulk. Snack on a hard-boiled egg when hunger strikes between meals. Not just any soup will do, but consuming a bowl of vegetable soup before a meal has been shown to reduce calorie intake at a meal by up to 20 percent, according to the journal Appetite. This is because vegetables are low in calories, but full of fiber, which helps satisfy appetite. Choose a bowl of vegetable soup before you eat a meal and you can lose weight by cutting your total calorie intake. The following choices work well, though the choice of vegetables doesn't matter too much. According to the Journal of the Academy of Nutrition and Dietetics, eating oats plays a positive role in the reduction of waist circumference. This may be due to its fiber content, which can help control your appetite. Try oats in the following ways to boost your weight loss goals. Make homemade muesli with oats, dried fruit and a sprinkle of nuts. Toss oats in low-fat muffin mix. Toast oats and grind them in a food processor. Combine plain yogurt and fresh fruit, then sprinkle the mixture with the oats. You may have heard that avocados are high in fat and should be avoided for weight loss. This is not necessarily sage advice. Avocados contain oleic acid, which can help quell hunger, note the experts at Health magazine. Try these ideas to get some avocado into your diet. Just stick with about 1/4 of an avocado for the best results. Top an omelet with avocado slices. Add avocado onto a lean turkey and low-fat cheese sandwich. Toss avocado cubes into a vegetable salad. Use mashed avocado in place of mayonnaise in tuna or chicken salad. Weight loss isn't always an enjoyable venture. Make it more fun by challenging yourself to try one of these weight loss foods each day. Try out new recipes to create meals and snacks you'll look forward to eating. The key to maintaining your weight loss is to make permanent lifestyle changes, says the Mayo Clinic. For that reason, it pays to mix and match these foods and include them in your healthy and well-balanced diet for effective weight loss.